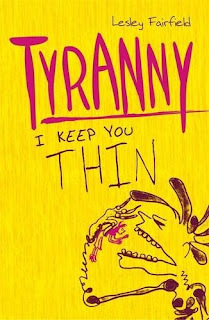 In Tyranny, brisk, spare text and illustrations that deal head-on with anorexia propel the reader along on Anna’s journey as she falls prey to the eating disorder, personified as her tormentor, Tyranny. The novel starts with a single question: “How did I get here?” The answer lies in the pages that follow, and it’s far from simple. Pressured by media, friends, the workplace, personal relationships, and fashion trends, Anna descends into a seemingly unending cycle of misery. And whenever she tries to climb out of the abyss, her own personal demon, Tyranny, is there to push her back in. The contest seems uneven, and it might be except for one thing: Anna’s strength of character has given rise to her deadly enemy. Ironically, it is that same strength of character that has the ultimate power to save her from the ravages of Tyranny. 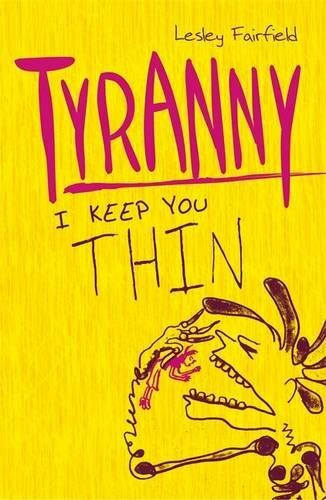 Brilliantly and realistically presented, Tyranny is a must-read for anyone looking for a better understanding of eating disorders and for everyone looking for a compelling page-turner that is truly a story of triumph and hope. I don't usually read graphic novels because I don't always get them. I get confused about where I should be looking and reading. I was offered this for review and accepted it mainly because I thought considering the content matter it would be a fantastic one for the school library once I had finished with it. Tyranny follows the story of a girl and her battle with Anorexia. I thought it was really touching and poignant dealing with a difficult subject in a very accessible way. What was the most scary thing about it is that the first steps the girl started down before she developed the full disorder were doing (or not doing) things that I know many young women do or feel about themselves. It was quite moving in places as you could see that this young women had got herself in a real state and lost everything just trying to conform with society's ideal about body image and appearance. All in all a very quick read which highlights the dangers of anorexia in an accessible way. I hope this book does really well and makes its way into the hands of young and teenage women and makes them think and helps them to make the right decisions about a balanced healthy lifestyle. I have never even seen a graphic novel. I assume it's a bit like a comic? This one sounds interesting. Maybe I should give one a go. Books about anorexia scare me. With two pre-teens I worry about the route they will go down. I never know whether I should read them or not! I thought this one had a really powerful message and you're right, I think it'd be good for young women to read it.